A loan of $10,000 helped buy butchery equipment to allow us to expand our on-farm butchery capabilities (currently hogs and chickens and hamburger-beef only) to include beef cuts, lamb, and game. Theo was raised in Silverton, Oregon where his first jobs were working in fields for local farmers, driving farm equipment, and working for large food processing companies. He worked in agriculture initially, and then for Hewlett Packard, while going to college (Oregon State University) and earned a degree in Engineering Physics. After graduating, he started a small publishing company that wrote books about HP calculators, then started a technical writing company, which he expanded into a software localization company and grew through the 80's and 90's until he sold the company in 1998. It is currently the Corvallis, Oregon office of translations.com. Two of Theo's sons, born in the 1980's had serious health issues that eventually brought awareness of serious misinformation campaigns that are effecting the health of families around the world. Theo's wife Kira had health issues that were resolved through corrected information on foods and proper nourishment. All of their exposure to misinformation over several decades culminated in creating Helios Farms, which is a fun and energizing business committed to profitably correcting misinformation about raw milk, centralized agricultural practices, and to supplying foods that are not modified from their edenic form. It helps a dedicated farmer stay committed to the highest animal ethics. Helios Farms sells livestock shares and farm stays that reconnect people to the farm and to traditional, chemical- and pharmaceutical-free foods. The centerpiece of our farm is a raw dairy that delivers fresh, lab-tested, Jersey milk to farm share owners from Roseburg to Portland, Oregon. We bought our first Jersey Cow (Cindy Moo-Who) in 2010 after we discovered that Kira, who had not been able to drink milk all of her life due to digestive upset, could drink raw milk, and it was soothing to her system. We both were raised with agricultural backgrounds and had raised our own foods in the past, so getting a cow was not a big stretch. At the time, we only had access to a couple acres, and we rapidly outgrew that, acquiring more cows and taking on more customers. 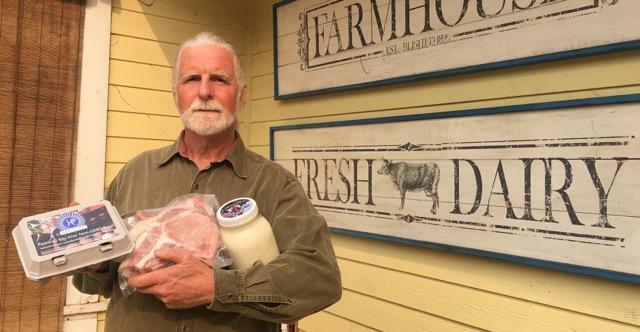 Soon we had outgrown the on-farm raw-milk sales restrictions in Oregon, so we switched all of our customers to farm share owners, selling them shares of the cows. Our livestock shares contracts were created and we committed to building a business that would bring people closer to the farm, to chemical-free, ethical, decentralized food supply for their families. In 2013, we made the move to full-time farming on a 160 acre farm. Like Kira, people report that the foods we harvest and deliver resolve health issues in themselves and their children (food allergies, asthma, eczema, etc.) that they experience with commercial meats and processed dairy. These reports inspire us and drive us forward through farming challenges. We are committed to bringing pristine, restorative foods to more and more families in Oregon. Helios Farms is supported by investors, farm share owners, and volunteers who love our agricultural and husbandry methods, which are chemical and pharmaceutical free. Helios Farms currently offers on-farm butchery of hogs and chickens. Our customers are "farm share owners" and they come to the farm to attend the harvest of their animals. We offer beef shares, and previously have used custom butchers to butcher beef. We want to do all butchery on farm and have built a new structure to house the butchery. This loan will be used for equipment and finish work in the butchery to allow us to handle beef and game easily. Equipment will include: Band Saw ($3,000), Wiring/Plumbing ($2,000), Wall and boom construction ($1000), Railing (Steel and Welding Services) for moving carcasses ($2,500), Flooring and other finish work ($1,500). Helios Farms is preparing for certification with the Global Animal Partnership. The highest level of animal ethics certification requires that animals spend their entire life on the farm. On farm harvest of beef gets us a necessary step to this certification.